Adding blinds to a room can be a great way to make a room’s décor a little more stylish and even unique. 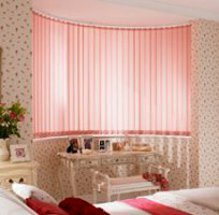 Blinds come in a whole host of different materials and are made in a wide range of styles and choosing the right ones can seem like a bit of a task, it really comes down to your personal and family preference, but to help guide you along the way here are some of qualities and drawbacks of the most common blind designs. These are ideal for more formal spaces such as dining rooms and living rooms. 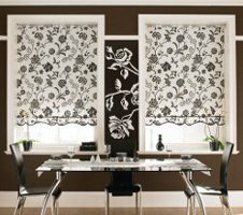 Based on a window dressing used in ancient Rome to keep rooms cool and dust free in the hot Rome summers, Roman blinds have evolved into one of the more elegant varieties of blinds. These blinds have horizontal slats that have been covered in fabric. Using a chord these binds can be folded up to resemble curtains. Roman blinds come in a very large variety of fabrics which allow you to choose not only a very precise colour but also what level of light you want the blinds to let in. It is possible to buy black out Roman blinds which will make a room completely dark and ideal for sleeping in, or blinds that will let a little light in but are suitable for providing privacy or shading TV and computer screens from glare caused by direct sunlight. Roman blinds can also be made from woods such as bamboo allowing them to be used outdoors or in rooms that are exposed to the elements; these are perfect for sunrooms and other summer spaces. These blinds are great for achieving a minimalist style. They consist of narrow horizontal slats generally made from metal, wood or vinyl. 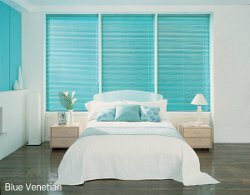 Many people who already have curtains but need additional control over lighting levels opt for venetian blinds. Under curtains they can look stylish but are still highly practical. The one drawback with venetian blinds is there reliance on long chords which may pose a hazard to families with young children. However safety devices can be obtained to ensure these chords hang out of the reach of children. Roller blinds are perhaps the most versatile blind style and can be used in any of your homes rooms. They are available in a wide range of colours and fabrics which as well as offering style options can help control exactly how much light a room lets in. Blackout roller blinds fitted close to a window are possibly the best choice when complete darkness is required. Roller blinds also tend to be among the cheaper of window dressing options so defiantly worth considering if you’re on a tight budget. Whilst most blinds that use slats hang horizontally vertical blinds hang horizontally, the advantages of this is that they do not collect as much dirt, and opening and closing them is an easier task. If you choose vertical blinds made from heavier materials they can be great for use with glass doors. They also close more tightly so can keep out more light than some horizontal blinds. The drawback of vertical blinds is that the mechanism that they rely on tends to be a little more fragile and does not have a life expectancy quite as long as you can expect from other varieties of blinds. Choosing your style of blinds really comes down to the space you are using the blinds in and the amount of light you wish to allow into it. Once you’ve chosen your style of blinds you just need to match the material that they are made from to your home’s colour scheme. Blinds are commonly made from fabric, wood and also various kinds of vinyl picturing each of these in your room will help you decide which ones will generate the right feel.